Ever wondered what it would be like to take part in an EcoNest workshop, or been on one and wanted to relive your experience for a few minutes? Our new video, filmed on location during the Intensive last Spring in Ashland, Oregon, is an amazingly accurate representation of what it’s like to participate in the workshop series. The more workshops we hold, the more we realize that there is no typical student profile. Each student brings their unique flavor and reasons for being there. Jens attended our EcoNest intensive this season taking most of the courses in Ashland Oregon this spring and then joining us on Salt Spring Island, British Columbia in August to complete the timber framing workshop. He recently joined us once again in Ashland for the Japanese woodworking class. Amongst our graduates Jens is typically atypical! PBL: Tell us a little about yourself. JW: I was born in Europe and grew up in Germany. I first visited the US when serving in the German Air Force. After working in banking and finance and obtaining my associate degree, I soon moved on to a more exciting career in aviation. I returned to the US for my pilot training and this time I stayed. 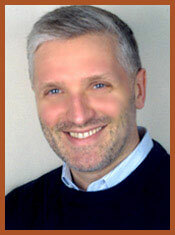 I first specialized in delivering small aircraft to Europe and then became a corporate pilot. Once I married Marlys, my American bride, I decided to pursue a more stationary career so that I could spend more time with her. So in 1999 we started Adrette Corporation in Portland, Oregon, specializing in fine custom window treatments and quality fabrics for homes and offices. PBL: How did you become interested in EcoNest? JW: We became interested in healthy homes as an aspect of our growing environmental awareness. We realized that Marlys’ asthma and allergies were exacerbated by poor indoor environments and began to study how to make homes healthier. I took some of the Building Biology seminars offered by IBE and there I learned about the EcoNest hands‐on training. PBL What was your motivation for taking the EcoNest Intensive? JW: The idea of getting some first‐hand experience in building according to the Building Biology principles was very appealing to me. I was intrigued by the idea that someone like myself, who had very little previous building experience, could come and be part of an ecological, hand‐crafted building project. Marlys and I really want to have our own healthy and ecological home built one day, and I want to participate in the building of that home. PBL: What was the best part of the workshop experience? JW: The best part was twofold… The first part was being able to learn from experienced craftsman like Dale and Robert and the other assistants while working with them side-by-side. The second was about the very rich connection that developed amongst the workshop participants. I didn’t expect the depth of fellowship that I experienced. Our backgrounds were so vastly different yet I think we all felt a similar bond…it was fun. Overall, taking the trainings this season was one of the most satisfying things I’ve ever done. PBL: What was the most challenging part of the workshop experience? JW: I found it challenging to build with my hands after 20 years of being seated either in the cockpit of a jet or in front of a computer. I’m not a youngster and construction work is physically demanding. I had to learn a new level of attentiveness to my physicality in order to stay safe in these new surroundings. PBL: Do you have any words of advice to prepare students going in to the program? JW: I felt well prepared for everything the weather threw at us. Having appropriate clothing and layers for a wide range of conditions was important. It was a little difficult to find reasonable accommodations in Ashland and in retrospect I wish I had camped as did many of the other participants. What’s in the future for you now? I am motivated to continue on my educational path becoming a certified Building Biologist. I look forward to educating and exciting others about healthy building. I also anticipate building our own healthy home one day in the not too distant future. Perhaps it is my European back-ground that makes me intent on building something that will be serviceable for a couple of hundred years after I am gone. As we teach in our interior design business… ‘Longevity is Sustainability’…do it right in the first place with the highest quality of materials and workmanship and it will last. Then you won’t need to do it again. 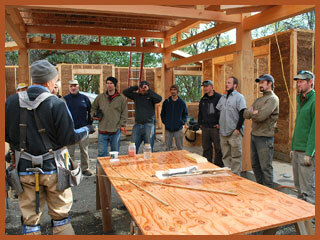 We’ll be releasing the dates for our next year of natural building workshops very soon. There will be apprenticeship opportunities available for budding artisans seriously interested in learning sustainable home building.